SAO PAULO - Brazil has given special training for more than 10,000 members of an elite federal security force to help better control demonstrations expected during the World Cup later this year, the Justice Ministry and a top security official said Friday. Col. Alexandre Augusto Aragon, who heads the elite National Security Force, said that 10,000 riot troops selected from state police forces throughout Brazil will be deployed in the 12 cities that will host World Cup matches June 12-July 13. "We've have been concerned with this (security during the World Cup) before the protests that took place earlier ... because we don't wait around for things to happen," he told the G1 Internet portal for Globo news. "The violence of recent protests is what scared us." The Justice Ministry, which oversees the National Security Force, confirmed in an emailed statement that more than 10,000 National Security Force members have received training for patrolling protests since 2011 and that they'll be used during the Cup, augmenting the security work of local police and soldiers. At the peak of last's protests, 1 million people took to the streets across Brazil in a single day, complaining initially of higher bus fares, corruption and poor public services, and then extending to the billions of dollars being spent on the World Cup and 2016 Rio de Janeiro Olympics. Police faced sharp criticism for scenes of brutal crackdowns on the protests, including at times seemingly random use of pepper spray, rubber bullets and stun grenades. "There will be no World Cup," became one of the mass movement's most popular chants. "FIFA go home." was another. The demonstrations coincided with the Confederations Cup football tournament, a warm-up tournament for the World Cup. Jerome Valcke, the top FIFA official in charge of the World Cup, said recently that the tournament would have "the highest level of security you can imagine" to contain any violence. Valcke said he was satisfied with the police response during the protests that affected the six Confederations Cup host cities, where scenes of sharp clashes between protesters and police played out just a few hundred meters (yards) from the stadiums. Still, the tournament went on as scheduled and none of the matches were disrupted. He said he expects the same type of response if there are protests this year. The Black Bloc anarchist protest movement has announced plans for protests of the World Cup, starting with the opening match on June 12 in Sao Paulo. A Black Bloc Facebook page listed demonstrations for June 13 in Natal, Salvador and Cuiaba, followed by six more protests in six cities on June 14 and 15. Brazilian authorities have said that they've learned from the demonstrations during the Confederations Cup and will not let protesters get too close to stadiums during the World Cup. In December, Andrei Augusto Rodrigues, security head for major events at the Justice Ministry, acknowledged that police misjudged the threat to public safety in Rio de Janeiro in June at the final of the Confederations Cup. 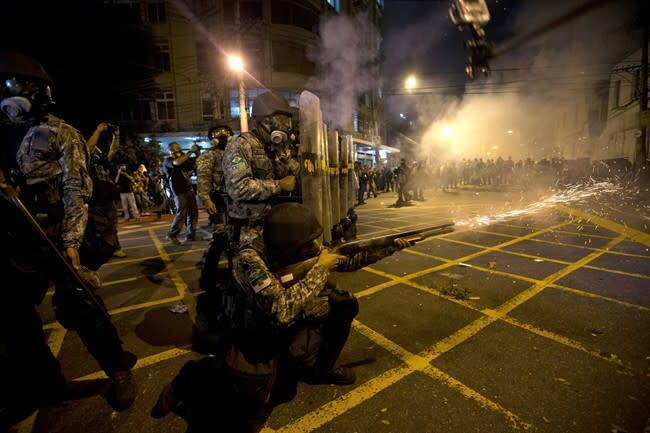 Police used tear gas against protesters outside Maracana Stadium where the final was held. Clouds of the gas wafted toward the stadium caused vendors at refreshment and souvenir stands to cough and tear up. Protesters got within 200 (meters) yards of the stadium, packed with 70,000 spectators for the Brazil-Spain final. Rodrigues has said that police will keep demonstrators farther away from stadiums during the World Cup.